Moorreesburger is an exciting venture that combines a training facility, restaurant, bakery and micro-brewery, as well as student accommodation all in one location, adding value to Moorreesburg as well as the greater Swartland and its people. Omni HR Consulting is proud to support local communities and to assist in supporting a sustainable future for Moorreesburger. Moorreesburger launched in January 2017 with a group of seven learners on a twelve-month learnership in bakery skills. The aim of the learnership, to upskill local youth of Moorreesburg and allow them to be exposed to a classroom and bakery environment, making them marketable to outside businesses. 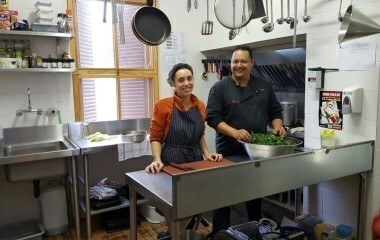 The learners were also expected to work in the restaurant environment and gained valuable skills. Subsequently a further three, eight-week, bakery skills programmes have been offered to previously disadvantaged and local youth in Moorreesburg. The programme is accredited with the FoodBev SETA. These programmes have allowed us to offer focused and practical training interventions, allowing for a larger group of learners to become skilled. The on-site bakery is managed by a Master Baker who also instructs and coaches our learners, allowing the bakery to supply the restaurant with fresh breads and confectionary daily. They also work on an order basis, regularly supplying to local schools and for various functions. This allows for work integrated learning and the learners can see how their skills impact on business.Moorreesburger is the ideal training facility for both small and larger groups of up to fifteen delegates. The environment is conducive to learning and Moorreesburger can offer a variety of learning and development initiatives that suit the needs of both entry level delegates as well as those that wish to complete compliance training or add to their skills set. There has been a successful Retail Readiness Programme run at Moorresburger where learners engaged in both classroom and practical learning allowing them to build on their entrepreneurial and key business skills. Not only has Moorreesburger employed some of the previous learners, but the opportunity was also given to local qualified Moorreesburg residents to apply for and be employed in positions at Moorreesburger. In addition to the programmes offered Omni has been involved in the sourcing of learners, the training interventions and the operational support including Human Resources and IT support. We value each individual, the team that they are a part of, and how each individual and team are able to better themselves through learning and development. We see this as a journey, where attending delegates are able to develop new skills, put these skills into practice, and realise their goals in a challenging and fulfilling environment.Moorreesburger has continued to grow, allowing more youth to be employed to service the growing needs as Moorresburger becomes a firm favourite with the local residents. From facilitating learning at a Waste Recycling company to creating environmentally sustainable bags. Manufacturing a range of bags made from unused off-cuts and other recycled materials, Tabitha Tshikala (nee Biseka) is a true success story.An entrepreneur at heart, Tabitha registered Revive That as a close corporation in 2010, producing a range of bags from messenger bags, tool bags, backpacks and more. Like many new business ventures, it took a while for the business to take off as Tabitha encountered her fair share of challenges along the way. In 2014 she joined forces with Prosper Tshikala where they planned the future strategy of the business (and their future as a married couple) together. In 2016, the relationship between Revive That and Omni HR Consulting took off at an exponential rate with an order of 4 200 messenger bags for a Retail Readiness Programme. To safeguard the physical components for each learner, such as learner guides and assignments, we needed to ensure that the bag we earmarked was water-resistant, durable and able to withstand most environmental and circumstantial elements. This resulted in the Revive That team offering a solution which doubled their production capacity which required additional equipment resources to meet the demand.Initially, the rate of exponential growth overwhelmed Tabitha and Prosper but the team at Omni HR Consulting were quick to provide guidance and advise, supporting the couple to craft solutions that addressed their production performance, administration, stock administration and resourcing requirements. 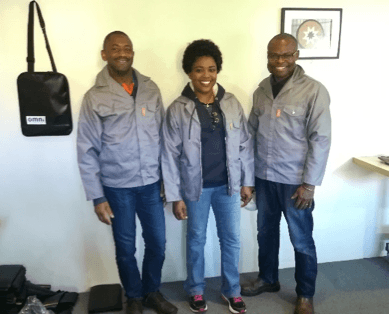 According to Prosper, “Omni provided us the opportunity to bring our current team together.”Fast forward to 2019 and Revive That have produced in excess of 15 000 recycled messenger bags for the Retail Readiness Programme. ​They have also grown their product range and are now looking to expand their services to schools, local government and agricultural businesses. When questioned on their view of their experience of partnering with Omni HR Consulting to date, they responded that “the results have exceeded our expectations. We have dedicated staff who have passion and vision. We have embraced and adopted many of Omni’s values and principles. That is why we will continue to grow, prosper and participate to the betterment of our society. The philosophy of perseverance where ‘all things are possible to those who believe’, our refusal to stagnate and our embracing of principled behaviour, based on values of openness, ethical living, service excellence, honesty, constructive communication, integrity and fairness will ensure that we grow in the future.